Bravely Second‘s release in Japan–April 23!–is fast approaching. Square Enix is appropriately escalating their promotional efforts towards hopefully repeating a successful commercial performance for this new entry in the Bravely series. This past week saw the announcement of two new jobs in Japan’s Jump magazine: the Fencer and the Bishop. A scan from that recent issue of Jump magazine is posted above, showcasing some of the new jobs present in this game. Magnolia (second from the right) is shown in the Bishop costume, and Edea (far right) is shown in the Fencer costume. The Bishop specializes in abilities associated with White Magic like healing, resurrection, and Holy spells. Apparently the job will be able to enhance certain magic capabilities (similar in principle to the game’s new Wizard class and its use of Black Magic.) We’ll see what kind of competition the Spiritmaster has; the Spiritmaster already was an amazing job in Bravely Default, but its presence in this game isn’t certain. The Fencer specializes in abilities that attributes like speed of attack, and defense. There is a stance ability exclusive to the Fencer that grants the user access to special Sword weapon techniques. Square Enix has been conducting livestream sessions of Bravely Second leading up to the game’s release. Recently, Square Enix also uploaded a video onto YouTube recapping the jobs revealed for the game thus far. The new jobs introduced for this game include: Tomahawk, Patissier, Cat Master, Astrologer, Exorcist, Guardian, Chariot (which Yuu, second from the left, is rocking), and Wizard (shown off by Tiz on the far left, whose look altogether suggests he just got out of bed) and the newly revealed Fencer and Bishop. 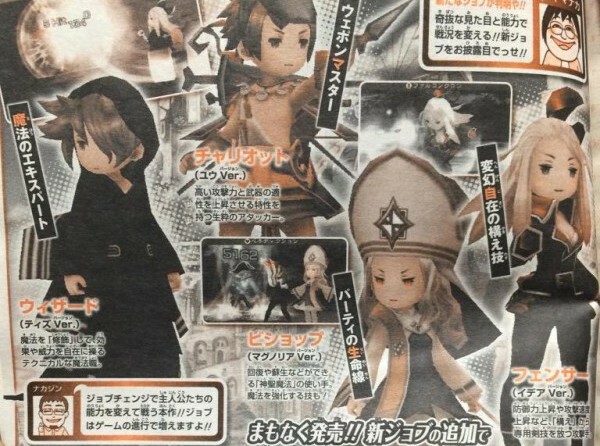 It’s possible there are more to be seen, and several jobs from Bravely Default aren’t currently confirmed for Bravely Second. And who’s to say all of them will return? In any case, be sure to check out the new jobs trailer below!